The House of Mystery has been seized and Swamp Thing imprisoned – the work of the sinister Doctor Destiny. 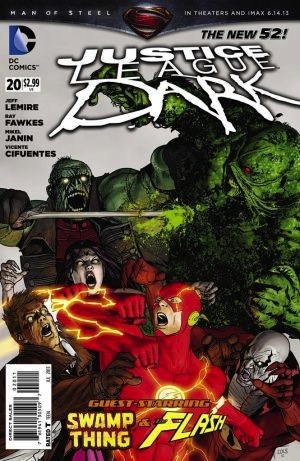 He has sent his nightmare creations to battle the Justice League Dark, who have recruited The Flash to aid them in the fight. These are the events that bring us up to issue 20 which is the second part of a three issue story arc by Jeff Lemire and Ray Fawkes with artwork by the very impressive team of Mikel Janin and Vicente Cifuentes. The Flash and Frankenstein find themselves assailed by Doctor Destiny’s constructs of Frankenstein’s bride and their son. The abominations seem to be similar to the Green Lantern’s constructs in that they are the product of “hard energy”, a material The Flash is able to dispel by use of his vibrations. This is a method that will serve them well in battles to come. The two are then off to find the rest of the team beginning with Madame Xanadu, which The Flash accomplishes in scant seconds. At this point in the story Doctor Destiny is slowly torturing Swamp Thing with fire and a prophecy that promises his ultimate demise. While elsewhere Deadman finds himself at the merciless hands of a twisted perverse troupe of circus performers before he is rescued by Frankenstein, The Flash and Madame Xanadu. The next order of business is to rescue their fearless leader, John Constantine, who is at that very moment busy fighting himself – specifically duplicates of himself made of his own blood. The team shows up and thanks again in large part to The Flash, they make rather short work of the constructs and save Constantine’s chain-smoking cantankerous hide. Far from a happy reunion, the Justice League Dark welcomes their leader back into the fold with accusations and threats. The plucky Englishman takes it all in stride and suggests they get on with the business of finding The House of Mystery. Once again it falls to The Flash to get this done and once again he does so in a split second. He locates the house and off goes the team to retrieve it; however it is not in its original form – it is twisted and spreading like a patch of bad weeds. 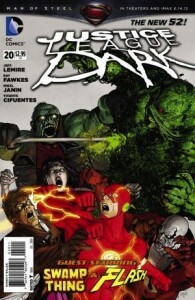 Constantine dispatches Frankenstein and The Flash to deal with any street level threats while he and the others go inside in search of Swamp Thing. They are met straight away by Doctor Destiny who greets Constantine as The Last Mage. This leads to a final page cliff-hanger that very deeply impacts the League as a whole but one particular member even more so. Trust me, you will want to read this issue. There is an under-current of dissension in the ranks all through this issue as the rift between Constantine and his team mates begins to become a chasm. His arrogance and shoddy leadership seem to be pulling the team apart. Lemire and Fawkes are writing the Constantine book as well, so they have become the voice of this character who has been written by some of the best writers in comics today (Andy Diggle, Jamie Delano and Garth Ennis to name a very few). I find the use of Constantine not only in a team but as its leader to be quite contrary to his character but I am enjoying it – Lemire and Fawkes are doing a bang-up job. Constantine in the New 52 is definitely not Hellblazer of the Vertigo universe but it is a good read. I’m on board to see where this goes, whether he is replaced or remains on the team. Justice League Dark is a fun book with perhaps the most unique team dynamic anywhere in comics. Mikel Janin is superb. He is solid and consistent. His work is flawless. I can’t wait to see what he does on this title as we move into Trinity Wars. He handles the supernatural subject matter so well, especially the scenes of Doctor Destiny. I would be remiss if I failed to mention Jeremy Cox’s colors here. He adds such dimension to Janin’s work that some of the pages look as if you could reach into them. Overall Justice League Dark is one of the books I look forward to every month. It has been solid since the inception of the New 52 and I hope it continues to gain the readers and recognition a book of this calibre deserves. I unreservedly recommend adding it to your pull list especially now with Trinity Wars gearing up.